Phoebe Waller-Bridge plays L3-37 in "Solo: A Star Wars Story"
Is the newest droid in the "Star Wars" universe the future of modern robotics? 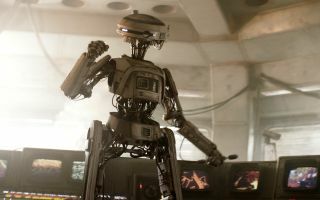 In the recently released film "Solo: A Star Wars Story," the droid L3-37, also known as L3 or Elthree, showcased a unique set of traits among "Star Wars" robots. The intelligent pilot droid is always changing, improving and repairing itself with found scraps from other bots. L3 is also one of the first bots in the "Star Wars" franchise to bring feminine programming to a major role. In the article, Murphy described three main advantages that self-reconfigurable robots would have over traditional machines: They could make themselves more efficient at different tasks; they could be produced more cheaply than robots built for a singular set of tasks, and they could repair themselves and respond to any malfunction. But how close are we to building such a bot? According to Murphy, not that close. A self-reconfiguring bot like L3 would need to make sure that found and assorted hardware, electronics and software all fit together as it modified itself and made changes and repairs, Murphy told Space.com, but "how is this all gonna work?" Dextre, NASA's space handy-robot, is seen here, in 2008, on top of the Destiny Laboratory Module of the International Space Station (ISS). We may be far from building real "Star Wars" robots, but Murphy discussed the promise of bots, like the International Space Station's Dextre, which helps to repair other bots and equipment aboard the space station. However, as Murphy told Space.com, a human must program Dextre, which is operated with robotic controllers, so it doesn't function and fix on its own. This and other robots on the space station don't just repair each other; no robots are saying to one another, "Hey, help me fix this part," Murphy joked. And, as of yet, "I have no robots that are trying to organize a robot uprising," Murphy added.